Page one of the letter. Click to see larger image. Nine members of the House of Representatives with districts in Los Angeles County have signed a letter supporting the 30/10 Initiative to build a dozen transit projects in the next 10 years instead of the next 30. 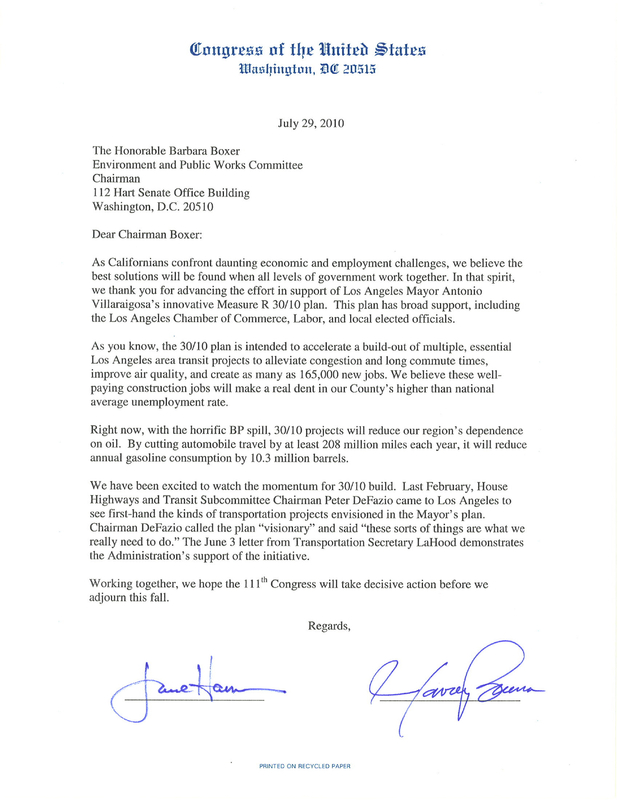 The letter is to Sen. Barbara Boxer, who chairs a key Senate committee and has already said she supports the 30/10 plan. Page two of the letter. Click to see larger image. 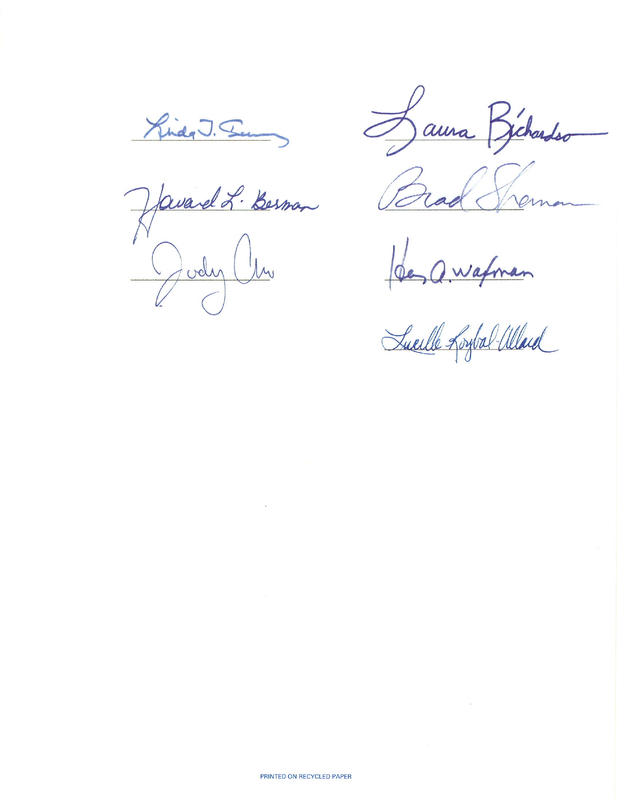 The signees included Jane Harman (who was on board early with 30/10), Xavier Becerra, Linda Sanchez, Laura Richardson, Howard Berman, Brad Sherman, Judy Chu, Henry Waxman and Lucille Roybal-Allard. Interesting! I’m not sure if that means the cup is half full or half empty, given that elements of 30/10 will need Congressional approval and local support may help. The 30/10 Initiative proposes to use other federal loans and other financing to accelerate construction of the transit projects, all of which are set to receive funding from the Measure R sales tax increase approved by county voters in 2008. The money would be paid back using Measure R revenues. The idea of the program is to get all this stuff built now while construction costs are down. The other idea is to create a lot of jobs while building some sorely needed mass transit. L.A. Mayor Antonio Villaraigosa issued a press release Thursday praising the nine members who signed the letter. The 30/10 plan was conceived by Villaraigosa and later adopted as the official policy of Metro by the agency’s Board of Directors. The list of L.A. County’s Congressional delegation is posted after the jump, along with their contact information in case you feel like expressing your views on 30/10 to any of them. You can also cross-reference the list to the letter and figure out who didn’t sign! A map of the 30/10 projects is also after the jump. Click above to see larger map. 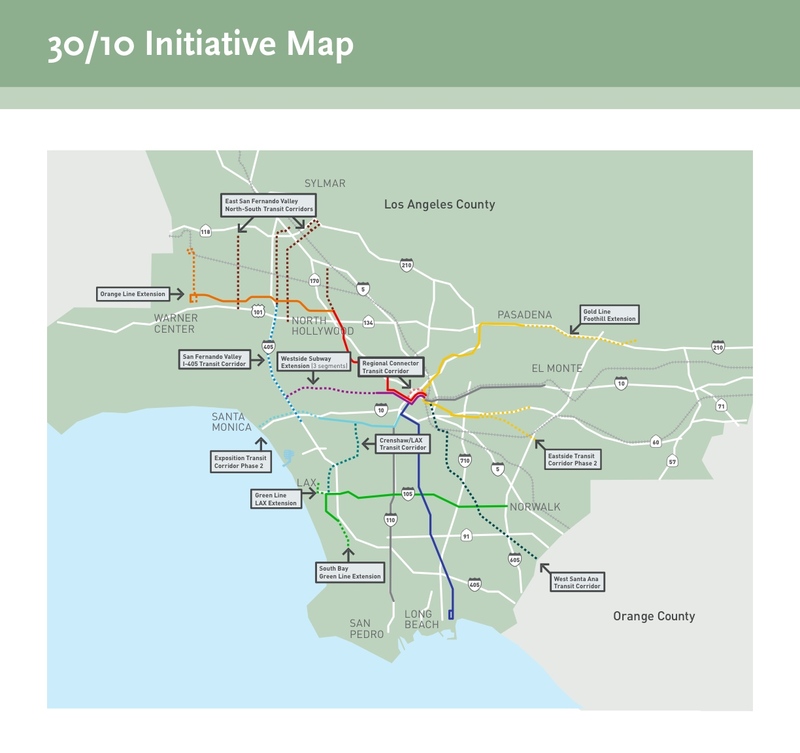 Among the projects the 30/10 plan proposes to accelerate and/or help fund are the Westside Subway Extension, the Green Line Extension to Torrance, the Crenshaw Line, the Downtown Regional Connector, the Gold Line Eastside Extension phase two and a Sepulveda Pass transit line to the San Fernardo Valley, among others.